hana, 23 Jun 2014i am a samsung user even my fren also. samsung always get crash and hang. so anyone note 3 ... moreI did have the same with samsung. It always crashed, occasionally. It never happens with HTC One Max. Smoothly running, no lagging. AnonD-220775, 26 Jan 2014One Max for me :)I think the basic thing is what you want the phone to do for you. i am a samsung user even my fren also. samsung always get crash and hang. so anyone note 3 user, pls tell me note 3 are same like other samsung fon that have this problem or not anymore? i have one friend addicted to mobile devices, at last he is buy HTC One Max. he said this is the best at the moment than others. Never hang like samsung. Guys, any comment on this? The HTC modem draws less power. However, it's not mentioned how this affects reception in poorer coverage areas. More power should = stronger reception.. 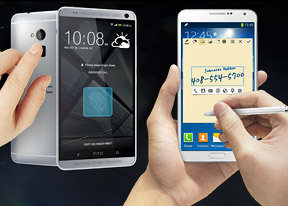 I have both of those Phaplets, yes Note 3 comes with more advanced software unlike HTC one max. But overall performance actually the SAME even though HTC one max outperforms Note 3 in web browsing plus the Sense HTC Ui polished more smoother and faster plus plink feed it's fantastic unlike Note 3 knock off plink feed. Camera yes Note 3 wins but not on low light and not all still photo cause Max better with micro than Note 3, screen no doubt Max , battery, life Max, finger print scanner works 80% out of 100% and that's great if we compare it to IPhone 5s. Anonymous, 06 Feb 2014The Max basically is the pick for those who need the cheaper price point. Even design some may... moreMax is cheaper than Note 3?! Since when Note 3 this days it's cheaper than IPhone 5 brand new LOL. I bought both S4 and note 3 and due to the missed calls showing in the screen saver..i gave them away as gift the same day. I like galaxy note 3 because it's a new thing here's a lot of features..the camera result is out standing.. The processing speed is very fast as compared to HTC one max. Latest update messed up the keyboard by reducing the size of the keys to the S3 size, removing one of the main advantages of using a phablet. Ridiculous. Great device. Bad update decision. Hopefully this gets considered and fixed asap. TIMMY , 11 Feb 2014htc is different league samsung has same boring design Actually the Note 3 all around has it's own new design. And Note series with Amoled, waycom, and spen are what is in a different league. But the style in note 3 is boring. ))).